For the first time ever, the steps of the BC Legislature will be filled with the distinct smell of cannabis smoke. At 4:20 pm on April 20, as thousands of cannabis enthusiasts are expected to turn out to both protest and celebrate the new era of legalization. Though bylaws restrict the smoking of cannabis to a few public places, organizers have received authorization to go ahead with the annual celebration that usually brings large crowds to Victoria City Hall. Since the late 1960’s, a growing number of cannabis smokers have smoked cannabis at 4:20 pm, with large gatherings starting to form 25 years ago. Ted Smith, a local cannabis activist, was the Master of Ceremony at the first 420 in Vancouver in 1995 and he will be the ringleader at this year’s occasion at the B.C. Legislature. Ideally the best place for this event would be Royal Athletic Park but it would take support from the CRD to grant a smoking exemption for such an event. City Hall has been the focus of cannabis activists in Victoria for the last 21 years on April 20 but with cannabis now legal, it seemed time to move to a more high profile location. Nothing will be for sale at this event, as the rules for gathering at the BC Legislature do not allow soliciting or sales of any kind. Sponsors of this year’s Ápril 20 event include: the Victoria Cannabis Buyers Club, BC Smoke Shop, Shaman Headquarters, Mr Fertilizer, Living Leaf Remedies, Viridesco, Euphoria, Green Freak Treats, Absolute Medicinal, Dope Soap, Potent Industry and the Cannabis Digest. 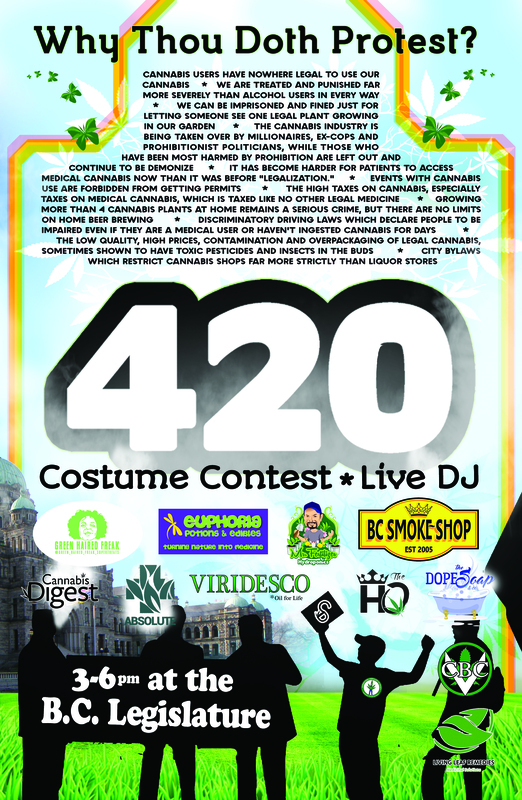 A costume contest will also be held to entertain the masses while they puff tough on the front steps of the Ledge. We are so EXCITED to announce that music will be sponsored by the incredible talent at Submersive Tribe Studios. Next article How do we retain women and minorities share of the edible market in Canada?